The Raychem T2 Quicknet electric underfloor heating mat is ideal for renovations, at only 3mm thick. The product is particularly suited for use under ceramic tiles or natural stone. 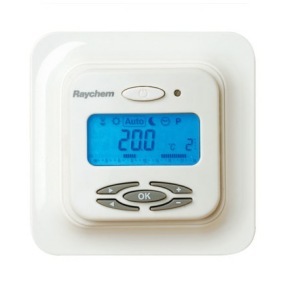 The Raychem T2 Quicknet 90 is suitable for well insulated floors and for complementary heating. Please click on the image below to order. The Raychem T2 Quicknet 160 is suitable for fast heat up and poorly insulated sub-floors. Please click on the image below to order. 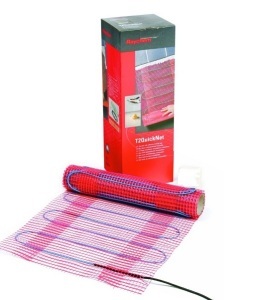 Click here to order Raychem T2 Quicknet 160 underfloor heating mat. With one cold lead (dual wire system), it is ideal as direct underfloor heating for embedding in tile adhesive or filler underneath the top floor. Maximum construction height including tiles is 15mm. 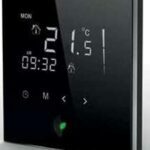 No thermostat supplied, please choose from the contemporary Greenleaf thermostat or NRG thermostat. Raychem T2 QuickNet 90. Raychem T2 QuickNet 160. Nominal voltage. 230 VAC. 230 VAC. Nominal Power output. 90W/m. 160W/m. Maximum exposure temperature. 90°C. 120°C. Approvals / Certifications. VDE, CE, SEMKO. VDE, CE. Circuit breaker. 13Amp – Max heating surface 33m². 13Amp – Max heating surface 18m². RaychemT2 QuickNet Plus 90 pack. Surface Dimension. Power. Reference number. T2QuickNet-1.0. 1 m2. 0.5 m x 2 m. 90 W. 6012-8171051. T2QuickNet-1.5. 1.5 m2. 0.5 m x 3 m. 135 W. 6012-8171052. T2QuickNet-2.0. 2 m2. 0.5 m x 4 m. 180 W. 6012-8171053. 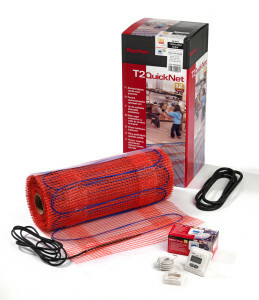 T2QuickNet-2.5. 2.5 m2. 0.5 m x 5 m. 225 W. 6012-8171054. T2QuickNet-3.0. 3 m2. 0.5 m x 6 m. 275 W. 6012-8171055. T2QuickNet-3.5. 3.5 m2. 0.5 m x 7 m. 320 W. 6012-8171056. T2QuickNet-4. 0 4 m2. 0.5 m x 8 m. 360 W. 6012-8171057. T2QuickNet-4.5. 4.5 m2. 0.5 m x 9 m. 405 W. 6012-8171058. T2QuickNet-5.0. 5 m2. 0.5 m x 10 m. 450 W. 6012-8171059. T2QuickNet-6.0. 6 m2. 0.5 m x 12 m. 545 W. 6012-8171060. T2QuickNet-7.0. 7 m2. 0.5 m x 14 m. 630 W. 6012-8171061. T2QuickNet-8.0. 8 m2. 0.5 m x 16 m. 725 W. 6012-8171062. T2QuickNet-9.0. 9 m2. 0.5 m x 18 m. 800 W. 6012-8171063. T2QuickNet-10.0. 10 m2. 0.5 m x 20 m. 915 W. 034118-000. T2QuickNet-12.0. 12 m2. 0.5 m x 24 m. 1100 W. 6012-8171072. Raychem T2 QuickNet Plus 160 pack. T2QuickNet-1.0. 1 m2. 0.5 m x 2 m 160 W. 986618-000. T2QuickNet-1.5. 1.5 m2. 0.5 m x 3 m 240 W. 1244-001831. T2QuickNet-2.0. 2 m2. 0.5 m x 4 m 320 W. 060364-000. T2QuickNet-2.5. 2.5 m2. 0.5 m x 5 m 400 W. 1244-001832. T2QuickNet-3.0. 3 m2. 0.5 m x 6 m 480 W. 168506-000. T2QuickNet-3.5. 3.5 m2. 0.5 m x 7 m 560 W. 1244-001833. T2QuickNet-4. 0 4 m2. 0.5 m x 8 m 640 W. 036330-000. T2QuickNet-4.5. 4.5 m2. 0.5 m x 9 m 720 W. 1244-001834. T2QuickNet-5.0. 5 m2. 0.5 m x 10 m 800 W. 441162-000. T2QuickNet-6.0. 6 m2. 0.5 m x 12 m 960 W. 349790-000. T2QuickNet-7.0. 7 m2. 0.5 m x 14 m 1120 W. 7152522-000. T2QuickNet-8.0. 8 m2. 0.5 m x 16 m 1280 W. 605750-000. T2QuickNet-9.0. 9 m2. 0.5 m x 18 m 1440 W. 723132-000. T2QuickNet-10.0. 10 m2. 0.5 m x 20 m 1600 W. 728236-000. Please click on the links below to download information about the Raychem T2 QuickNet. RAYCHEM T2 QUICKNET INSTALLATION MANUAL. RAYCHEM T2 QUICKNET 90 SPECIFICATION GUIDELINE. RAYCHEM T2 QUICKNET 160 SPECIFICATION GUIDELINE.